Social sharing service Buffer, which auto-schedules updates to optimize your sharing across social networks, has become one of the first third party clients to support Google’s one-week-old domains API for Google+. 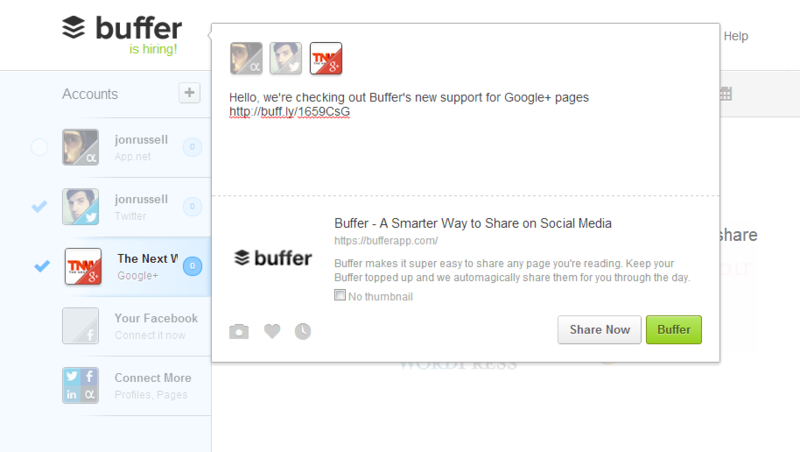 To make use of the feature — which is in ‘early access’ phase — users connect their Google+ Page within Buffer’s Web-based dashboard by visiting bufferapp.com/get-google-plus. Thereafter, they can schedule new updates for the page using Buffer’s staggered posting system — which schedules content to specific, pre-set posting times. Buffer recently added a custom sharing time setting, and it also includes a ‘Share Now’ button which both provide further options. Google announced a select few third parties as launch partners for the new API, though they were all companies — such as Ocado and Clocklock — which are building inhouse features. Buffer looks to be the first social media platform to develop support for the API, in the same way that it was an early supporter of BlackBerry 10 and ad-free social network App.net. It also supports posting content to Facebook, LinkedIn and Twitter. Those of you hoping for support for personal Google+ accounts will need to wait until Google releases the relevant API. For now, it’s focusing on serving business and corporate users.